1. I’m not a Doctor. 2. I’m not a psychologist. Everything I write, assume, and state regarding God, ghosts, angels, the paranormal or metaphysical, is a DIRECT result of my own personal experience. I promised never to embellish, to write exactly how it was, is, or how I remember the experience out of personal integrity and respect to this gift. There is no ‘sorta’ haunted. But I’ll know the answer within minutes. Sometimes the problem is electrical. If you hold your cell phone in your hand too long, you know what I mean. There’s a *feeling* that permeates your hand. And it doesn’t feel good. That same *feeling* can fill up a room if you’ve got too much crap plugged in. Especially in a small space. And sometimes, someone in the household is a major turd and emits funky energy that hangs in the air like a bad fart. Or sometimes nothing’s wrong at all and people lie for attention. Maybe they want to fake out the “psychic” and prove that people see what they want to see. But sometimes, there really are ghosts. There’s a long, tangled string of possibilities. But we never know until we show up, right? So I was approached about maybe visiting a house in New Braunfels, Texas. Friend of a friend. There aren’t a whole lot of people that do what I do, so I get these calls fairly often. And I don’t mind. 1. I always take people seriously. 2. I don’t discount anything. 3. My gut will tell me otherwise. I agreed to go over, and asked that the house be empty when I got there. Why? Because then I sense the actual house and not the people living there. People exude their own energies. If I walk in an empty kitchen and feel NOTHING but the hum of the refrigerator, then there’s nothing. 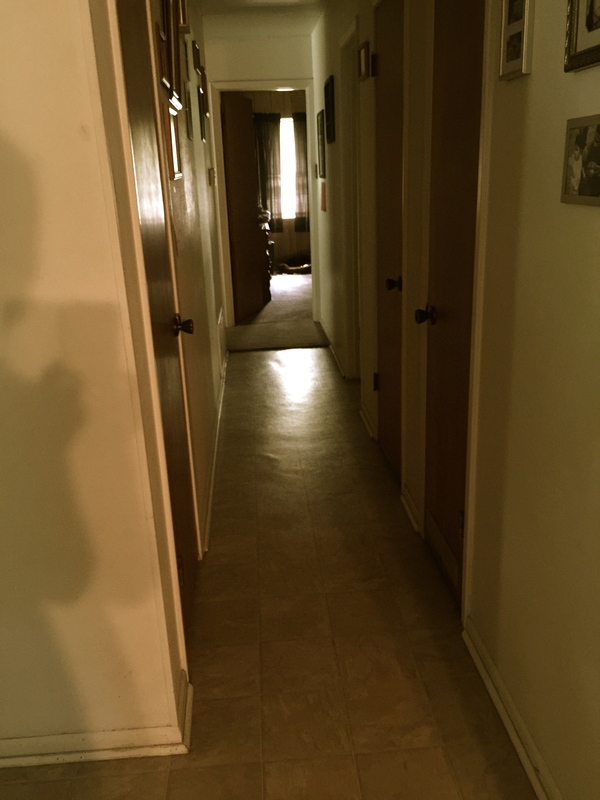 The space is “clean.” But if I feel nothing, then someone (living) walks in and I feel uneasy, well, then, we know the issue is the person, or something attached to that person, and not the house. Know what I mean? 1. It was psychic phenomena. 2. It was just a random headache. I wouldn’t be able to tell til I got there. Anyway, I prayed all the way there. I usually do. I ask God for spiritual protection, discernment, and that I leave having actually helped someone. Because ultimately, this isn’t about sounding cool at a cocktail party, it’s about service. 1. Yes, you’ve got ghosts. I am absolutely confident in my ability to do this. So Mom went outside and left me to it. I started in the front part of the house. Right away, I felt a little closed in. But they had dark wood 70’s paneling, which can produce the same feeling (at least with me). So I kept walking. The energy was heavy (not BAD, just heavy) over most of the front part of the house, but really, it just felt like leftover human emotions coupled with some dark walls. As renters, they have no control over that. It happens. And it’s not paranormal. I walked down the hallway. As I approached the end, where the bedrooms were, I admit I felt a little cautious. I don’t get scared. I just don’t. But I clearly felt that if there WAS something in this house, I was approaching it. I walked in Mom’s bedroom, skirted around her bed. Nothing. I held my hand out. Nothing. I walked to the far left corner and felt . . . something. Like a concentration of electromagnetic energy. Quite strong. But there were no electronics there. Nothing plugged in. I separated the blinds with my fingers. The A/C unit was close outside that window. So that could’ve been it. But that corner also backed up to her Dad’s room. Something told me to save his room for last. I need to disclose here that my headache was getting worse. I left Mom’s room and went to Bailey’s room. The energy in Bailey’s room was very, very heavy. I sat on her bed and closed my eyes. I waited. Did I feel a spirit in there? No. But something thick was definitely hanging in the air. It felt sad. Heavy. Claustrophobic. Then I started getting a little info. I saw an older couple. I sensed the sudden death of a male son. I got something about fishing/water. These three scenes weren’t necessarily related, but they definitely entered my mind and I didn’t put them there, if you know what I mean. Then I got up to go to Dad’s room. Remember, he suffered the nightmares, too. Bailey’s and his room are directly across from each other, and the small, carpeted space between their rooms felt pretty bad. The word I’d attach to it is ‘sad.’ I had a deep heavy on my chest. I felt short of breath. And I did feel nervous about going in his room. I reached down and turned the knob. 1. Her Dad knew I was coming over and didn’t want me in his space, so he locked the door. 2. Something affecting Dad didn’t want me in that space. So he locked the door. So that was a bummer. My gut tells me there was something behind that door. The one thing I could do was try and clear the funk in Bailey’s room so the poor child could sleep. I pulled Mom in. We lit candles, opened the window, and I prayed. I prayed out loud, and got chills down my left side. Good chills. Chills of we-hear-you-girl-and-we’re-here-to-help. I got the clear sense of the elderly woman again. A very loving, kind woman. Mom said she felt warmth spreading through her chest, too. 1. During my prayer, ‘Wanda’ repeated in her mind. 2. The older couple I saw could possibly be the current owners. His wife Wanda died a few years back. 3. “A man hung himself in that house,” someone told her upon moving in. She wasn’t sure she believed this. It’s still unconfirmed. Bailey came home as I was readying to leave. So did her grandfather. My headache came back full force. So bad I consented to an Aleve, and I HATE taking medicine. I asked Bailey to step in her room and tell me what she felt. She stepped in, looked surprised, and said it felt completely different. “How does it usually feel?” I asked. So I left without visiting Dad’s room, which makes the visit inconclusive. But Bailey got a good night’s sleep, and that’s enough.